Artist Jihan Zencirli wanted to “inspire delight and love” with her stunning work. New York-based tech company Squarespace went to spectacular lengths to celebrate Pride this Sunday, outfitting the entrance of its Manhattan headquarters with 15,000 rainbow-colored balloons for the occasion. Los Angeles-based artist Jihan Zencirli of Geronimo Balloons began erecting the giant balloon sculpture on the exterior of the Squarespace office, which is located in Manhattan’s West Village neighborhood, at 7 a.m. on June 23. By the time the five-story installation was completed that afternoon, Zencirli and her team had used 15,000 balloons, which ranged in size from eight inches to eight feet. Zencirli, who has been creating balloon sculptures for seven years, said her mission was to create an interactive moment for visitors from all over the world who were celebrating Pride in the city. Unlike traditional balloons made of rubber, those used in Zencirli’s display are organic and biodegradable. The organic balloons used in Zencirli’s display are biodegradable and 100 percent recyclable. Squarespace’s Chief Marketing Officer Kinjil Mathur told HuffPost that her company was “dedicated to empowering all individuals” and, as such, was eager to acknowledge a “celebration of diversity and inclusion” like Pride with the installation, which will be displayed until Monday evening. “My goal as an artist is less about an aesthetic agenda and more about an emotional experience to inspire delight and love,” Zencirli told HuffPost. 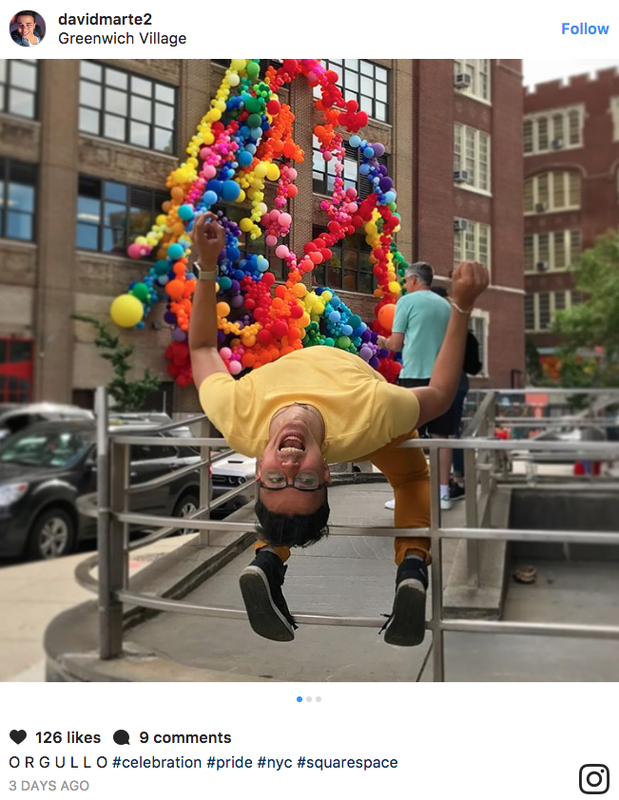 The balloon installation helped make Squarespace one of the city’s most-photographed spots during Sunday’s Pride festivities. Revelers, including fitness enthusiasts and a pair of newlyweds, happily posed in front of the balloon installation for snapshots posted on Instagram. Check out some of the shots below.